When a gunman showed up at Sparks Middle School in Nevada this past October, 45-year-old math teacher Michael Landsberry did not run away. Instead, he tried to convince the 12-year-old shooter to put down his gun. Landsberry was not successful, and he was killed for his efforts. However, his actions gave children time to get away, and he has since been recognized as a hero. “Mr. Landsberry’s heroic actions, by stepping toward the shooter, allowed time for other students in the playground area to flee,” Washoe County School District Police Chief Mike Mieras said at the time, according to CNN. Jon Kitna went from being a hero on the field to a hero in the classroomAfter retiring as a professional football player for the NFL, Jon Kitna became a teacher at Lincoln High School in Tacoma, Wash. Earlier this month, Kitna got back on the field for one game when he replaced Dallas Cowboys quarterback Tony Romo. He reportedly earned more than $50,000 for playing in the game — a sum he is donating to the school where he teaches. When Los Angeles Unified School District teacher Millicent “Mama” Hill retired, she did not stop serving the kids in her community. She turned her home into a community safe house where children could go for solace, food, shelter and help with academics. She says he is currently serving more than 3,000 children. In August, elementary school clerk Antoinette Tuff saved countless lives when she convinced an armed gunman at her Atlanta elementary school to put down his weapon and give himself up to the police. As a result, no one in the school was harmed.Tuff convinced the gunman to surrender by telling him about the struggles she’s faced in her life. 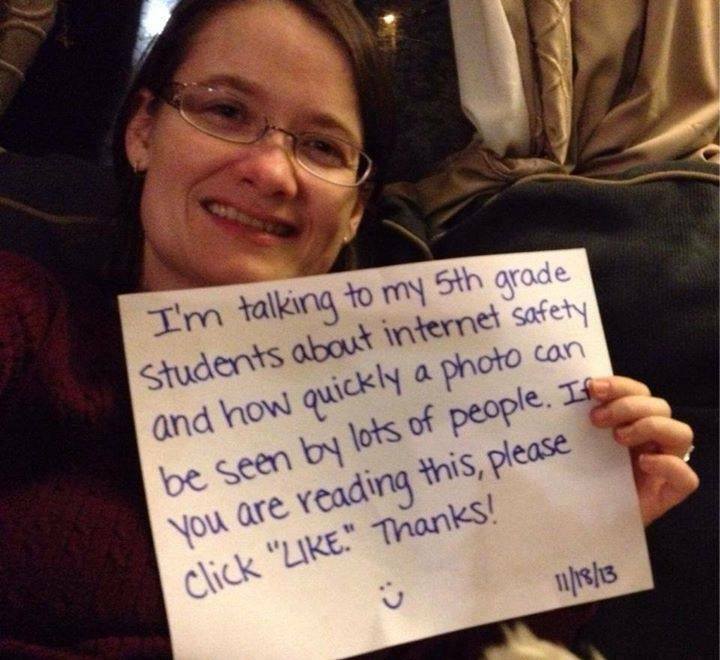 Julie Culp, a school counselor in Tennessee, successfully taught her kids about Internet safety in November when she posted this picture (above) on her Facebook and watched it go viral. The photo ended up gaining millions of likes from around the world — and showed that a little creativity can make a big difference when it comes to teaching. This entry was posted on December 31, 2013 at 11:20 pm and is filed under Inspirational Teachers. You can follow any responses to this entry through the RSS 2.0 feed. You can leave a response, or trackback from your own site.